1) In a medium-sized mixing bowl smash the bananas until smooth. *Kid Job: Mash those bananas! 2) Add the remaining ingredients and whisk together until well blended. *Kid Job: Help to pour in the coconut milk, sprinkle in the cinnamon, measure the vanilla, crack the eggs (with an adult helper), and whisk! 3) Grease a large skillet or griddle with coconut oil and heat over medium heat. 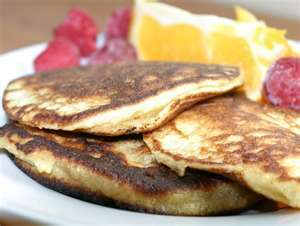 Scoop about 1/4 cup of the mix per pancake onto the hot griddle or skillet and cook for 1-2 minutes on each side. We just put all the wet ingredients in the food processor, mixed them and then added the dry and mixed it again. Much easier than smashing the bananas but that’s a good job for the kids as well. This recipe is from the book The Paleo Pals: Jimmy and the Carrot Rocket Ship by Sarah Fragoso. There is a link under my ‘Recommended Products’ tab where you can order this fantastic book for your kids.